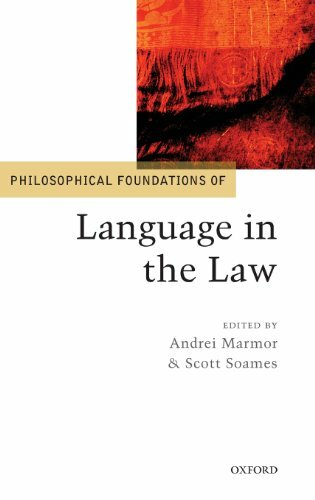 This collection brings together the best contemporary philosophical work in the area of intersection between philosophy of language and the law. Some of the contributors are philosophers of language who are interested in applying advances in philosophy of language to legal issues, and some of the participants are philosophers of law who are interested in applying insights and theories from philosophy of language to their work on the nature of law and legal interpretation. By making this body of recent work available in a single volume, readers will gain both a general overview of the various interactions between language and law, and also detailed analyses of particular areas in which this interaction is manifest. If you have any questions about this product by Marmor Andrei A Soames Scott, contact us by completing and submitting the form below. If you are looking for a specif part number, please include it with your message.